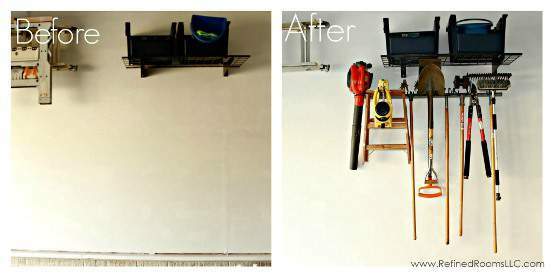 On the heels of the Garage Organizing 101 post from earlier this week, I am introducing a line of storage solutions made specifically for the garage – Monkey Bars Storage. 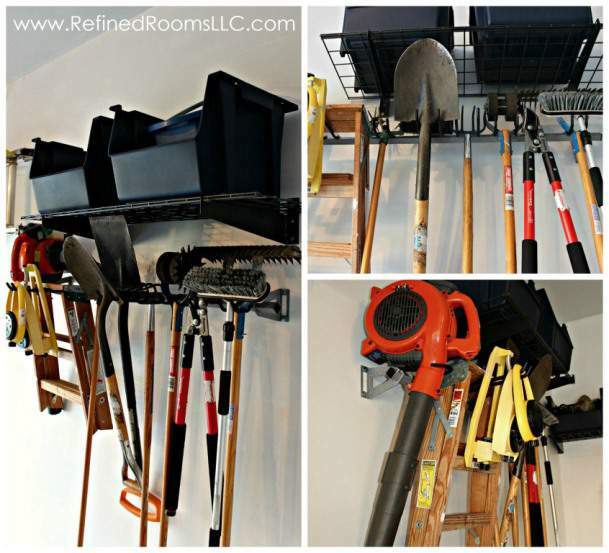 Monkey Bars Storage provided me with a Garden Tool Rack in exchange for my honest opinion regarding their product. Click here to read my full disclosure policy. Hmmm…should we stick with our traditional “board and nail” method? Nope. We made the decision to upgrade to a more functional and visually appealing storage system…that’s where Monkey Bars storage enters the picture. 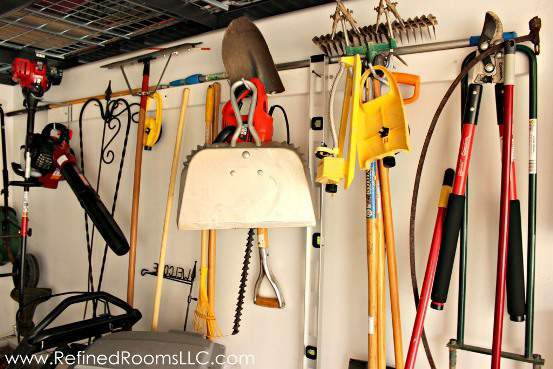 This month, I was given the opportunity to review a Monkey Bars garage storage product, and I knew immediately which product to choose…their Garden Tool Rack. 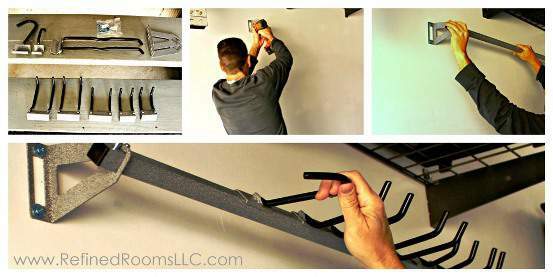 My husband LOVES a quick and easy DIY project, and the garden tool rack installation certainly fell into this category. It took him under 10 minutes to install it. It was simply a matter of locating wall studs, measuring to determine appropriate vertical positioning, attaching the wall brackets, inserting the hanger bar, and attaching the various hooks. Crazy Simple! In addition to being happy about the easy install, Dear Hubby was also quite impressed with the sturdiness and quality of the shelving components. Over the years, he has learned to discern what products can withstand the rough conditions of the garage environment, and he was confident that these all-steel components will stand the test of time. We have struggled for a long time to find a good home for our leaf blower…the rack’s “J” hook is the perfect place for this awkward item. 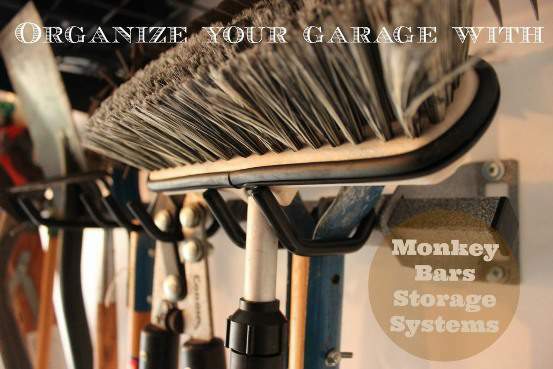 Take a look at what other products Monkey Bars Storage offers in order to help you achieve a state of organized Nirvana in your garage. They offer a range of fabulous garage storage solutions (shelving, cabinets, overhead storage), as well as epoxy floor coatings that create a polished look in your garage. They also offer expert installation service, in case you are not the DIY-type. 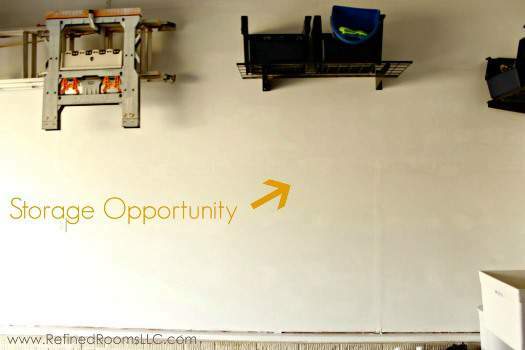 Now the exciting part…The kind folks at Monkey Bars Storage want to give Refined Rooms blog readers a chance to get started on their own garage organizing project. 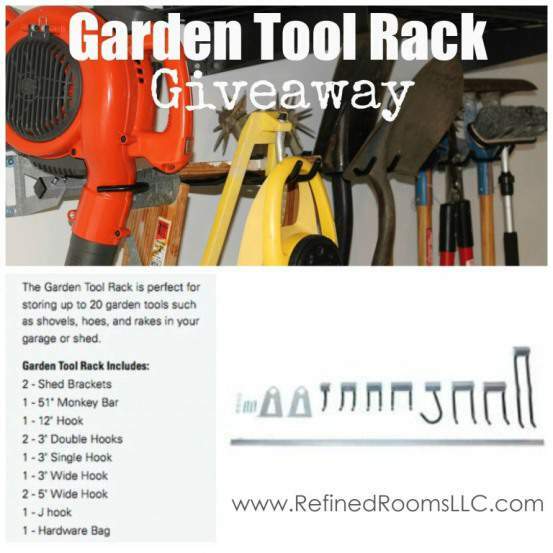 They are offering one lucky reader the chance to win their very own garden tool rack! The biggest organization problem we have is way too many tools for not enough storage. My biggest challenge is keeping it organized. Most items in the garage still need an official place to be put away/up. Kids toys. They are always afraid to get stuff out of tubs due to spiders. So the toys don’t get put back in either. we have TOO MANY bicycles! I need to find a better way to store our less used bikes. I was organizing my garage today. Just what I need. Tools are a real problem, and my gardening stuff. I have very little space to store anything this would help..
Finding a way to organize all the tools, including the ones that don’t fit in the tool box. Too little space and too much stuff is my greatest challenge. I love this giveaway! I totally need my tools organized! This is perfect. We have gardening supplies everywhere in our garage. It’s up on shelves, on the floor, on tables. There is not a proper place to put it, so it becomes hard to find. My biggest storage hassle in the garage has to be seasonal decorations! Sure, the ability to recreate night of the living dead in my front yard is awesome, but that means I have to have somewhere to store all those zombies the rest of the year. And just how many linear feet of icicle lights does one family need? I can’t narrow down our garage issues into one big problem! We have multiple problems. How on earth are you supposed to store all of the kids junk, your husband’s overflow of his woodworking hobby and all of the necessary yard items and still make it look nice?? I could really use your help on this one! The garage is often the first impression of the house! HELP!! Thanks Natalie. You are amazing. Our biggest garage challenge seems to be hubby’s tools, bikes, and sports balls everywhere. My biggest challenge: getting my husband to want to organize the garage! He wants to avoid purchasing and installing items that would create a neater, user friendly space. Great post, Natalie! I love the before and after pictures. Fingers crossed I’m your winner . . . I certainly could use this!! !